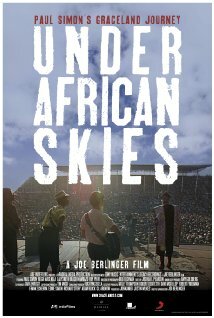 Under African Skies is three films in one: How Paul Simon’s musical master work was born, including footage of the first recording sessions; the 25th anniversary tour of South Africa that reunited the original artists and an exploration of the charges of racism and exploitation that dogged Simon’s most commercially successful album. Featuring commentary from Ladysmith Black Mambazo, Quincy Jones, Harry Belafonte, Paul McCartney, David Byrne and more. A feast of music, the film is an anatomy of a profound artistic achievement and a meditation on the role of the artist in society.